Oakland University is a nationally recognized public university offering students a personal, high-quality, affordable education through a diverse combination of liberal studies, professional instruction, and cultural and social experiences. Recognized as one of the country’s 83 doctoral research universities by The Carnegie Foundation for the Advancement of Teaching, Oakland University offers its more than 19,300 students opportunities to work directly on research projects with expert faculty who bring current knowledge right to the classroom. In all its activities, Oakland University strives to exemplify educational leadership. Anchored by a strong liberal arts program, the university is organized into the College of Arts and Sciences and schools of Business Administration, Education and Human Services, Engineering and Computer Science, Health Sciences, Nursing and The Honors College. The university’s full-time faculty, which numbers more than 500, has a distinguished record of research and scholarship. Faculty members have won some of the most prestigious awards made by government agencies and private foundations. Oakland received more than $18 million in grants and funding for research efforts across multiple disciplines in the 2010 fiscal year. Studies in biological and physical sciences and nondestructive testing attract national and international attention to Oakland University. Its highly recognized Eye Research Institute is the only major eye research center in the United States not associated with a medical school. The Center for Biomedical Research resides in the College of Arts and Sciences and facilitates collaborative biomedical research projects with core facilities and equipment. The Oakland University William Beaumont School of Medicine, Michigan’s first new M.D.-granting (allopathic) medical school in 47 years, welcomed its inaugural class of 50 students in August 2011. The university takes pride in the many scholarly books and articles written by its faculty and in its contributions to pedagogy and the creative arts. Undergraduate students at Oakland University are involved in high-level research projects, and the results of their research and scholarship are integrated into related courses of instruction. An unusually high proportion of Oakland University alumni have gone on to earn doctoral degrees or other distinctions in their fields. Complementing its academic programs, Oakland University collaborates actively with business and industry to foster economic development and meet the demands of a highly educated workforce in southeastern Michigan. The university offers world-class cultural activities, with emphasis on the professional performing arts. Meadow Brook Hall, former home of the university’s benefactors, became Michigan’s newest National Historic Landmark and serves as an historic museum and cultural center. Affiliated with the Department of Art and Art History in the College of Arts and Sciences, Oakland University Art Gallery exhibits promise something new for art enthusiasts of all ages, interests and passions. Founded on Oakland’s campus in 1967, Meadow Brook Theatre is Michigan’s largest non-profit producing professional theatre. Meadow Brook Music Festival brings an annual summer program of world-class entertainment to campus. Oakland University was created in 1957 when the late Alfred G. and Matilda R. Wilson donated $2 million and their 1,500-acre estate to Michigan State University to begin a new college in Oakland County. Named Michigan State University-Oakland, the new campus enrolled its first students in 1959. In 1963 its name was changed to Oakland University and in 1970 the Michigan Legislature recognized the maturity and stature of the university by granting it autonomy. The governor appointed Oakland University’s first board of trustees in 1970. From its beginnings, the university has emphasized academic quality, providing a dynamic, student-focused learning environment with integration of liberal and professional studies by a faculty of dedicated scholar-teachers. Oakland prides itself on providing a unique, distinctive undergraduate experience that is complemented by the strength of graduate offerings and research accomplishments. Oakland is focused on engaging with communities and developing partnerships, broadening its research agenda, providing opportunities for entrepreneurship and continuing its pattern of growth. Located in suburban Oakland County, Michigan, Oakland University is easily accessible to millions of Detroit metropolitan area residents. Oakland’s relationship with its hometown communities enriches student lives. Through partnership efforts with the cities of Rochester, Rochester Hills, Auburn Hills and Pontiac, internship opportunities are available to Oakland students, and many merchants offer discounts for OU students, alumni and staff. Through OU-Macomb, more than 20 Oakland University degree programs currently serve approximately 1,200 students at the Macomb University Center and the Macomb Intermediate School District. The Thomas M. Cooley Law School-Auburn Hills campus is the exclusive educational partner law school for Oakland University, making law school accessible to students from southeastern Michigan. The natural beauty of Oakland’s 1,443 acre campus, much of it still wooded and undeveloped, is enhanced by comprehensive recreational facilities and modern buildings that house the university’s many academic and public service programs as well as more than 2,100 residential students in its five co-ed residence halls, student apartment complexes and townhomes. Adjacent to the campus is the Oakland Technology Park, a research park where private-sector companies work hand-in-hand with higher education. The OU SmartZone business incubator, OU INC, provides entrepreneurial resources and strategic business solutions to develop intellectual property. Student research and internship opportunities are also enhanced by the proximity of many Fortune 500 companies. As a state‑supported institution of higher education, Oakland University has a three‑fold mission. It offers instructional programs of high quality that lead to degrees at the baccalaureate, master’s and doctoral levels, as well as programs in continuing education; it advances knowledge and promotes the arts through research, scholarship, and creative activity; and it renders significant public service. In all its activities, the University strives to exemplify educational leadership in a diverse and inclusive environment. Oakland University provides rigorous educational programs. A strong core of liberal arts and sciences is the basis on which undergraduates develop the skills, knowledge and attitudes essential for successful living and active, concerned citizenship. A variety of majors and specialized curricula prepare students for post‑baccalaureate education, professional schools, or careers directly after graduation. Each program provides a variety of courses and curricular experiences to ensure an enriched life along with superior career preparation or enhancement. The University offers master’s programs that meet demonstrable needs of Michigan residents and that maintain excellence. Doctoral programs are offered that are innovative and serve needs that are not adequately met elsewhere in the state. Offerings in continuing education provide Michigan residents with high-quality coursework for professional development and personal enrichment. The University strives to remain current and relevant through an adequate program of continuing faculty development and the exploration of innovative schedules, methods, and curricular design in keeping with the various needs of its diverse students, many of whom commute, work or are older than the traditional college-age student. Oakland University offers, and will continue to offer, only those programs for which adequate resources and well‑prepared faculty are available and for which a demonstrable need is expressed through the attraction of qualified students. In addition to their intrinsic value, research and scholarship reinforce the instructional mission of the University. Wherever possible, students are involved in research projects, and the results of research and scholarship are integrated into related courses of instruction. In carrying out its research and scholarship mission, the University seeks especially to be responsive to the needs of Michigan, particularly of the populous southeastern sector. Application of research and scholarship to problems and concerns of the state’s business and industry and to its scientific, educational, governmental and health and human‑service agencies serves also to reinforce the public service role of the University. Oakland University serves its constituents through a philosophy and program of public service that is consistent with its instructional and research missions. It cooperates with businesses, governmental units, community groups and other organizations on research, technical development and problem‑solving enterprises in an attempt to apply the expertise of the University to the issues of society in general or the region in particular so as to further enhance the quality of life in the service areas of the University. It attempts to maintain the degree of flexibility necessary to respond with innovative instruction, research and other service to rapidly changing needs. It makes its facilities available for a multitude of activities of agencies and community groups whose purposes are compatible with the mission of the University. It provides access to its programs and campus, insofar as is consistent with the role and scope of the institution, for the recreational and physical enrichment of area citizens. Cultural enrichment is provided for the community through the Meadow Brook enterprises, on- and off‑campus presentations by faculty and students, and other campus events. The University aims to provide a model of socially responsible decision‑making and ethical institutional behavior, recognizing that institutional strength derives from an effective interaction with the institution’s diverse external environs. 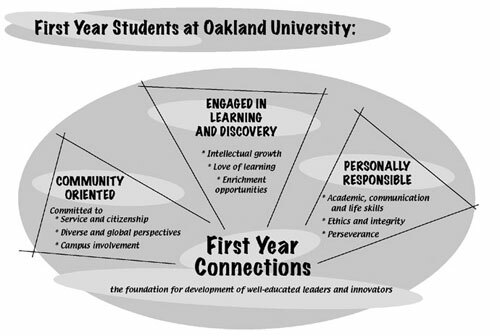 In direct support of its academic mission, Oakland University provides basic services and experiences that integrate cognitive learning with the personal growth of the individual student in the emotional, social, physical, cultural, ethical and interpersonal domains. In so doing, the University seeks to facilitate the development of those personal skills that will contribute to informed decision making and productive citizenship. This objective is accomplished through a variety of student enterprises, including campus organizations, athletics and other sponsored activities and events. Key to its achievement is the provision of a governance system in which students play a meaningful role in institutional decision‑making processes. The first year experience at Oakland University lays the foundation for student success by creating an environment that encourages intellectual growth and embraces learning as a lifelong pursuit. OU emphasizes personal responsibility, perseverance, and involvement in the campus and wider communities. Students are encouraged to behave ethically, to explore diverse perspectives, and to develop global awareness through strong academic programs enriched by activities and events. Goal: During the first year, students will engage in the process of intellectual growth, recognize and value the lifelong learning process, engage in dialogue and civil discourse, and learn to tolerate uncertainty and challenge. achieve sophomore status by the end of the first year. Goal: During the first year, students will set and actively pursue goals, make ethical decisions, act with integrity, and take responsibility for developing their academic, communication, and life skills. maintain personal well-being and a healthy lifestyle. Goal: During the first year, students will value service and citizenship, embrace diverse and global perspectives, and engage in the campus community. learn the importance of volunteerism and social engagement.